Finding aids are descriptive inventories or indexes that provide access to the unpublished materials in the Norwich Historical Society’s archives. If you are researching a family from Norwich, there could be materials in the photograph collection, general family vertical files, or within the family manuscript collection. Finding aids will be added to the website as they become available. 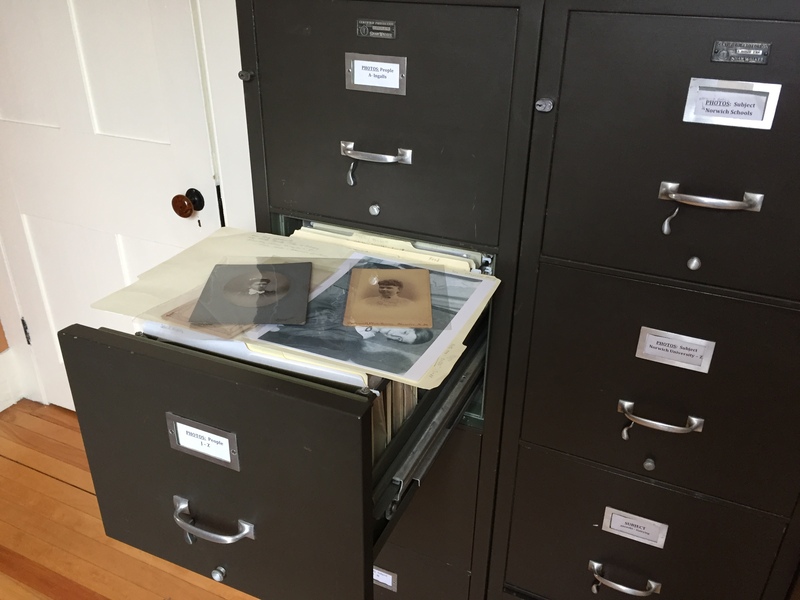 This collection is comprised of photographs, mostly black and white or sepia, that depict families, streets, farms, buildings, and events in Norwich, Vermont. Subsections are divided by family, streets, and general subjects. In addition to this collection, there are photograph albums and flat files of over-sized photographs. Finding aids for these albums and over-sized materials are in process. This collection is comprised of a wide variety of pamphlets, documents, and correspondence relating to Norwich, Vermont, families. There are original documents as well as photocopies of genealogical correspondence, family trees, newspaper articles, obituaries and other materials. Some family files have lots of materials, other don’t. Note that NHS also has an additional collection of Family Archives when there is a substantial amount of original family materials. Family researchers should check, the Family Archives Finding Aid, and the Photograph Collection Finding Aid. This record group consists of manuscript boxes filled with a variety of family materials. Genealogists and other family researchers should also consult the General Family Vertical Files and Photograph Vertical files. This collection is comprised of a wide variety of pamphlets, documents, and correspondence relating to Norwich, Vermont. There are original documents as well as photocopies of newspaper articles, pamphlets, menus and other ephemera.